. Giant pandas are black and white bears that live in temperate-zone bamboo forests in central China. 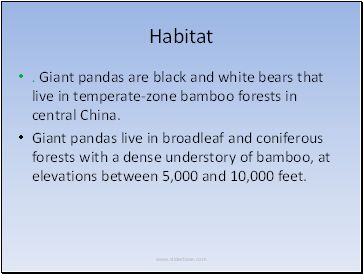 Giant pandas live in broadleaf and coniferous forests with a dense understory of bamboo, at elevations between 5,000 and 10,000 feet. A giant panda is bear-like in shape. It has black fur on ears, eye patches, muzzle, legs, and shoulders. The rest of the animal's coat is white. 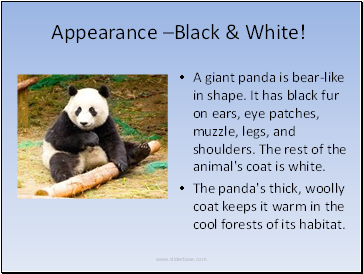 The panda's thick, woolly coat keeps it warm in the cool forests of its habitat. 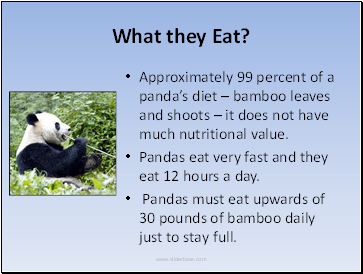 Approximately 99 percent of a panda’s diet – bamboo leaves and shoots – it does not have much nutritional value. Pandas eat very fast and they eat 12 hours a day. Pandas must eat upwards of 30 pounds of bamboo daily just to stay full. 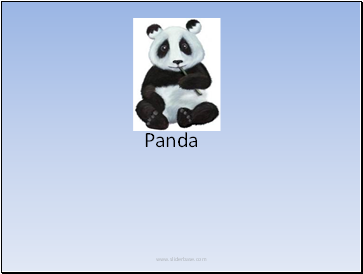 Panda ears act like its nose & its nose acts like its ears. That means ,it smells through ears & smells from ears. The pandas are very shy, they don’t go to areas where people live. Pandas are not affected by any human illness, except chick-pox. A blind folded Panda would always move north. 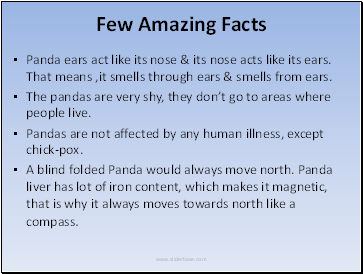 Panda liver has lot of iron content, which makes it magnetic, that is why it always moves towards north like a compass. One panda can live up-to 30 years. Young pandas live with their mothers for 18 months. It takes approximately 50 to 60 days for the panda cub to open its eyes. 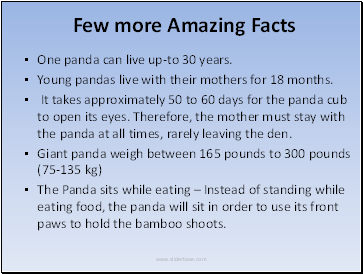 Therefore, the mother must stay with the panda at all times, rarely leaving the den. The Panda sits while eating – Instead of standing while eating food, the panda will sit in order to use its front paws to hold the bamboo shoots. 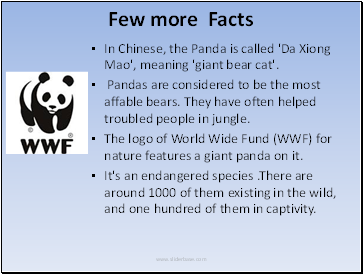 In Chinese, the Panda is called 'Da Xiong Mao', meaning 'giant bear cat'. Pandas are considered to be the most affable bears. They have often helped troubled people in jungle. The logo of World Wide Fund (WWF) for nature features a giant panda on it. It's an endangered species .There are around 1000 of them existing in the wild, and one hundred of them in captivity.